It was déjà vu all over again. Motoring back to the dock at the end of the boat test, I couldn’t help noticing the distinctive lines of well-worn Tartan Ten sitting on the hard. It was déjà vu all over again. Motoring back to the dock at the end of the boat test, I couldn’t help noticing the distinctive lines of well-worn Tartan Ten sitting on the hard. It was then that it struck me—that the C&C 101 is not just another racer-cruiser, but a direct descendent of the same, classic 33-foot S&S design that redefined the way people went sailing back in the ‘70s. Slippery, well mannered hull form? Check. Easy-to-handle fractional rig? Check. Expansive cockpit and tiller steering? Check, and check. How cool, I thought. And how far the world has come in terms of materials in design over the last 30-odd years! In terms of construction, the C&C 101—which is built by the same Northern Ohio outfit that builds today’s Tartans—is worlds apart from the old flush-deck T-Ten. Like the rest of the current Tartan and C&C line, the hull and deck are both made of infused epoxy with an end-grain balsa core in the deck and a foam core in the hull. Aluminum backing plates reinforce those parts of the deck that support load-bearing hardware, and the hull and deck are joined with a combination of stainless steel fasteners and 3M 5200 adhesive on an inward-turning flange. 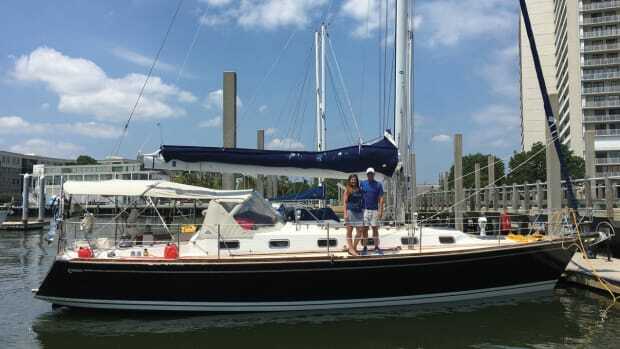 The mast is carbon, as is the rudderpost, the beautifully crafted tiller and the retractable, centerline bowsprit. 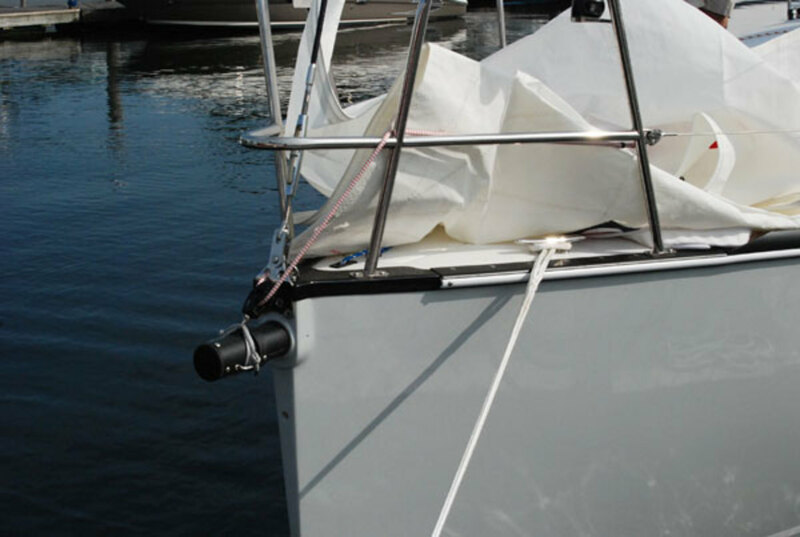 The latter is mounted in a shallow trough in the foredeck, which is sealed from the forepeak, eliminating the possibility of leaks. It also isolates the inboard end of the sprit from the interior, so it won’t ever bonk you in the head belowdecks as it’s being retracted. 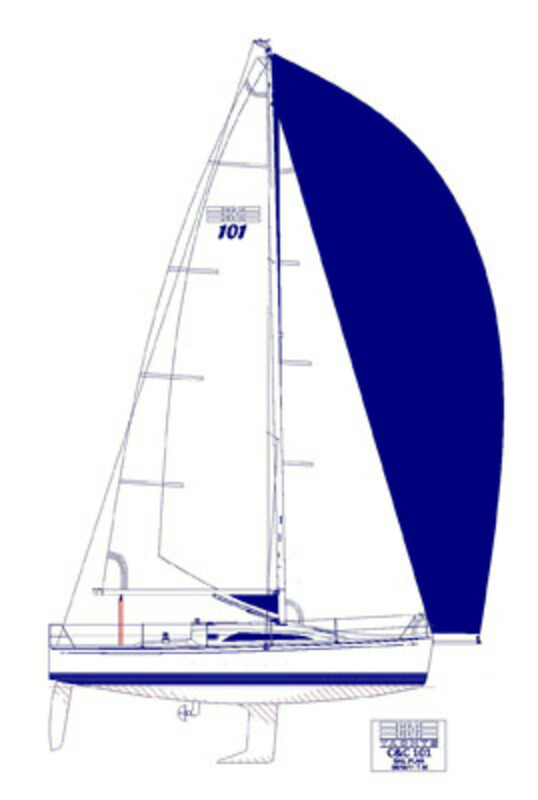 The rudder is a high-aspect semi-balance spade, and the 6ft 6in fin keel is lead with a pronounced bulb. Bulkheads are securely bonded to the hull and deck, and work in combination with a structural fiberglass grid to provide additional stiffness. 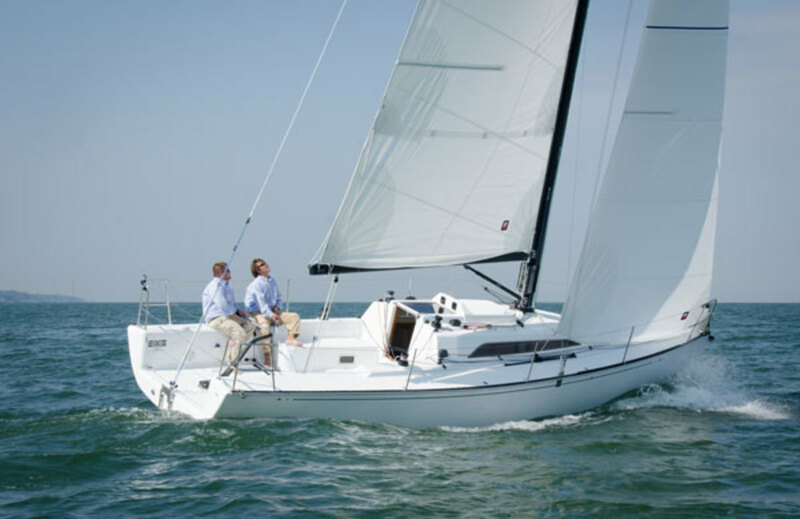 Overall build quality is excellent, exactly what you’d expect from one of North America’s leading boatbuilders. The cockpit and overall deck arrangement aboard the C&C 101 are, in a word, spectacular. On the one hand, the expansive, open-transom cockpit provides a wealth of elbowroom for a racing crew to do its thing. 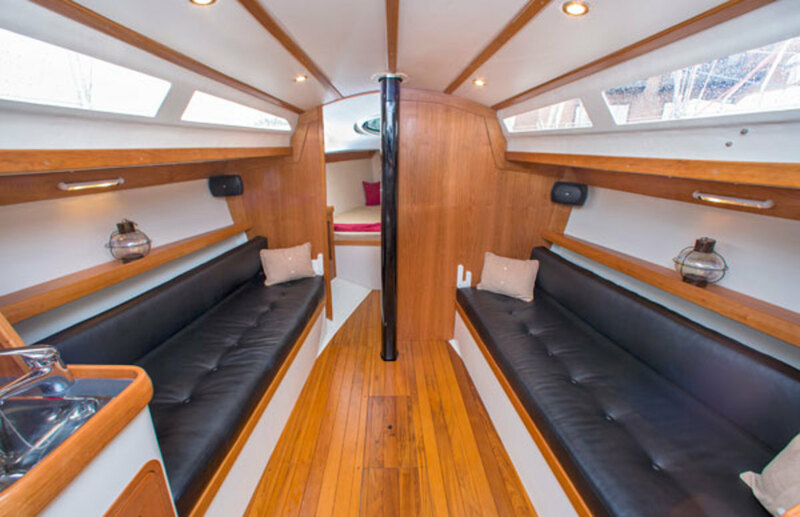 On the other, the short benches, combined with the well-sculpted side decks aft provide plenty of comfortable seating—for our test sail we had a crew of seven, and there was room for all. Although the Tartan Ten has long been lauded for its great cockpit, the cockpit on the C&C 101 is out of this world. 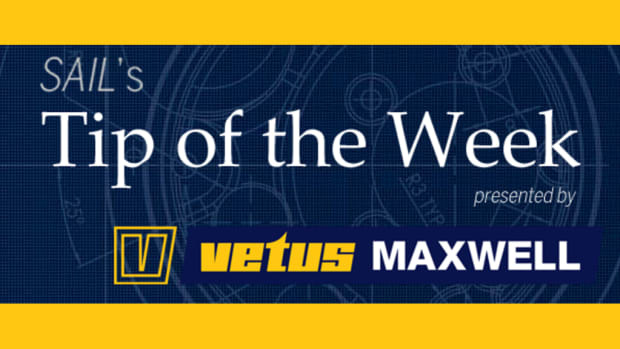 The primary winches are within reach of the person at the helm, but far enough away for a grinder to go wild hardening up after the leeward mark. 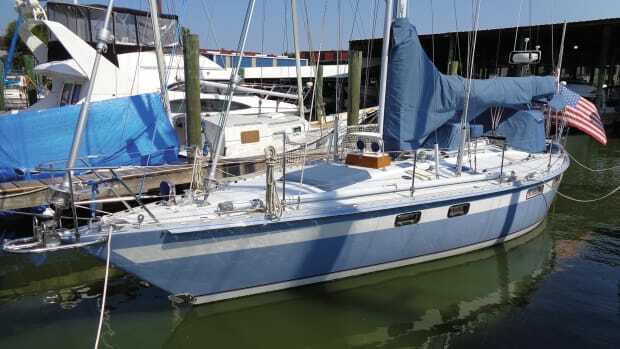 The main sheet includes a gross and fine tune, and runs from the end of the boom to a nice long traveller on the cabin sole—exactly as it should. Double-ended backstay control lines run to either side of the traveller, where they are within easy reach of the person doing the trimming. The backstay itself is aramid; the shrouds and forestay are wire. The cabintrunk may appear a little boxy in the drawings, but it looks good great in person, thanks in large part to its sharp-looking, C&C-style “slash” portlights. Going forward, stainless steel handrails fall easily to hand, and the uncoated, double lifelines are a comforting 2ft high. All that remains of the trademark aluminum C&C toerail of old is a vestigial stretch along the foredeck to help keep the bowman on board when the boat is on its ear. The lack of toerail aft will make life much easier for those doing prolonged rail meat duty. There’s a clever little storage space on centerline under the cockpit sole for stashing things like docklines and fenders. Overall workmanship is first class. I especially like the camfered edge along the top of the transom where it meets the cockpit sole and sidedecks.  The foredeck hatch is round to facilitate faster spinner sets and douses. My first impression upon going belowdecks was, wow! The difference between the accommodations aboard the C&C 101 and the cave-like space that serves as living space aboard the Tartan Ten couldn’t be more different. It really is incredible the difference three decades can make! 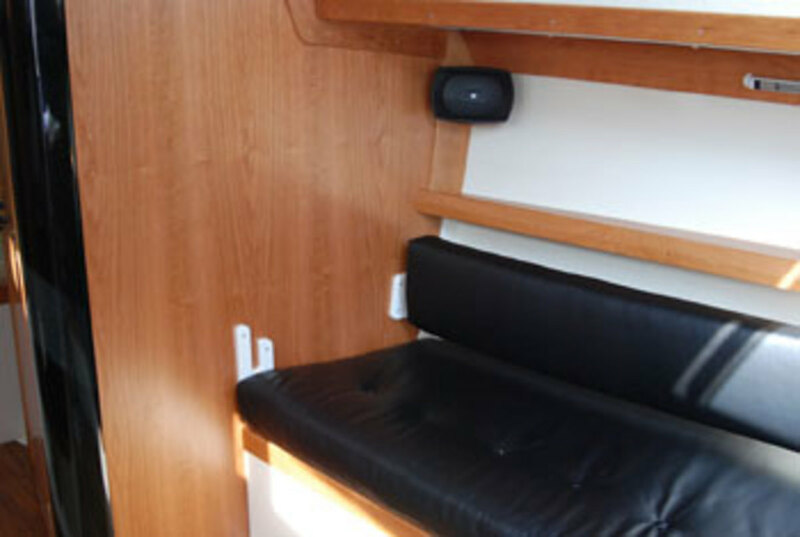 The boat’s nearly 12ft beam provides the necessary volume for nice big settees that will double nicely as sea berths (and include fittings for securing leeboards, in my mind a true sign that a boat means business), as well as space for a small but serviceable head, galley and nav station. 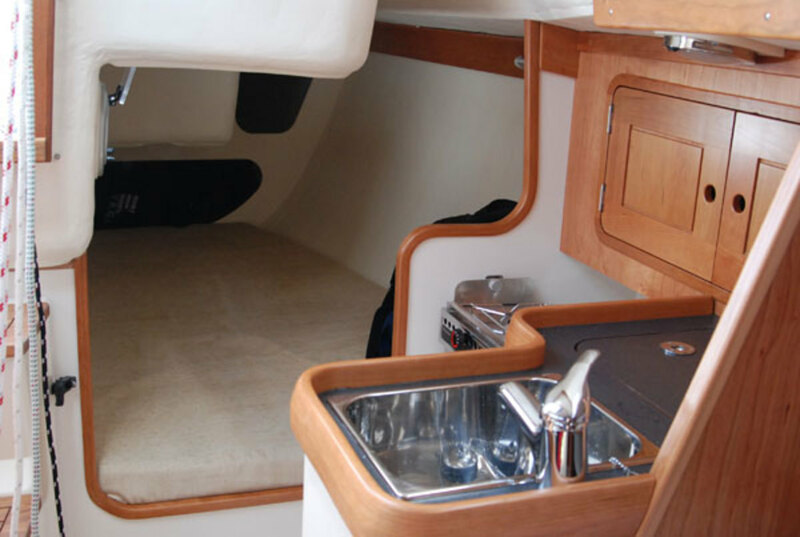 The twin quarterberths tucked under the cockpit benches take full advantage of the boat’s beamy aft sections to provide yet more space for tossing sea bags or sacking out. The large companionway and portlights ensure the entire saloon is awash in ambient light. 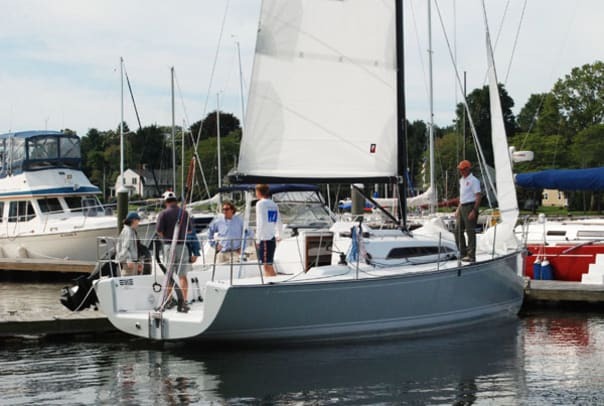 The result is a boat that would work great for coastal cruising or weekends afloat. Back out on the dock I paused to take another look at the boat and try to figure out how C&C in-house naval architect Tom McNeill managed to fit it all in—half expecting to discover some kind of deformity I’d missed the first time around. But while the C&C 101 is undoubtedly a boat with high topsides and plenty of volume in the ends, it’s still a looker—a true testament to McNeil’s design acumen. Conditions on Narragansett Bay the morning of our test sail would have made for challenging racing, but were perfect for seeing what the C&C 101 is capable of, slowly increasing from what was essentially a dead calm to 10-12 knots. 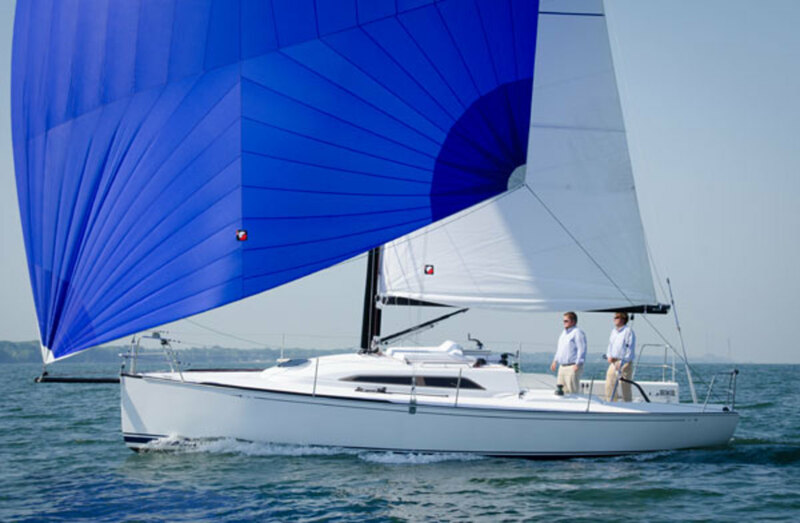 It has long been my contention that a good inshore racer-cruiser is one that is fun to sail in the light stuff, and the C&C 101 passed this test with flying colors. Chasing puffs in the beginning, the boat quickly got unstuck and never once lost steerage, even when the surrounding water showed nary a ripple. Later, as the wind picked up, the boat immediately picked up its skirts and started moving as well, creating the oh-so-satisfying gurgle of a slippery hull slicing cleanly through ripples and flat water. Coming about was effortless throughout the wind range we experienced, and tacking angles were right where they should be for work to windward. 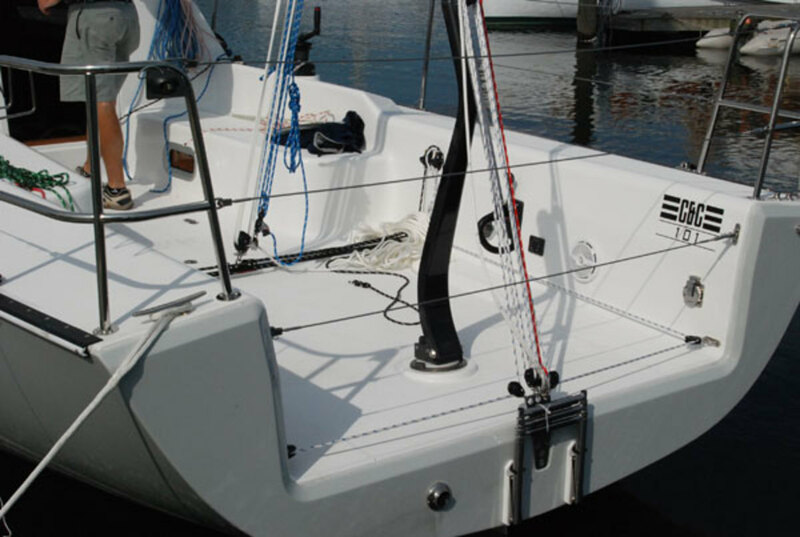 With a non-overlapping headsail like the one aboard the 101, there is absolutely no reason to ever have to grind the sail in with a winch, assuming you’re sheeting it in correctly coming about. Falling off onto a broad reach, we extended the “prodder” and hoisted the A-sail, which promptly ramped up the aforementioned gurgling to a whole new level. Kudos to McNeil and the rest of the C&C crew for equipping this boat with a tiller (a wheel is available as an option). 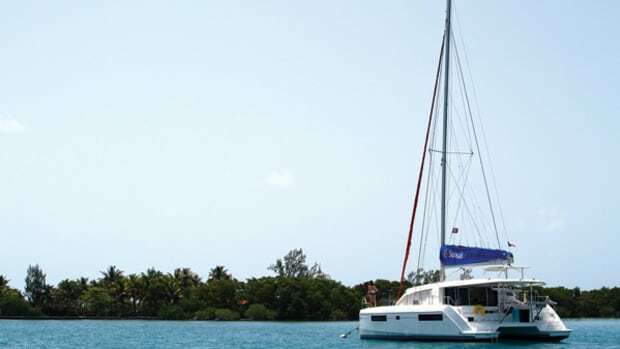 Whether you’re perched on the sidedeck keeping the boat in the groove sailing to windward, or standing on the cockpit sole sailing off the wind, it provides a direct link to the high-aspect rudder below, making steering an absolute joy. Having spent countless hours racing or just goofing around on Tartan Tens, I can tell you they’re a blast to sail in all conditions. 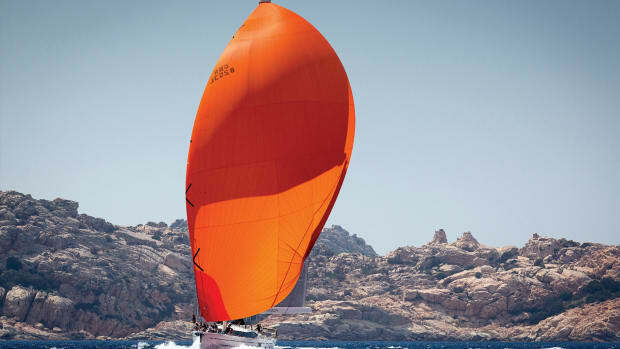 But even the fastest T-Ten wouldn’t stand a chance against the C&C 101, especially in the light stuff we experienced at the beginning of our test sail. This is another area in which it’s incredible to think back on how far boat design and construction has come. I can’t wait to get aboard the C&C 101 some day when it’s honkin’. No surprises here. 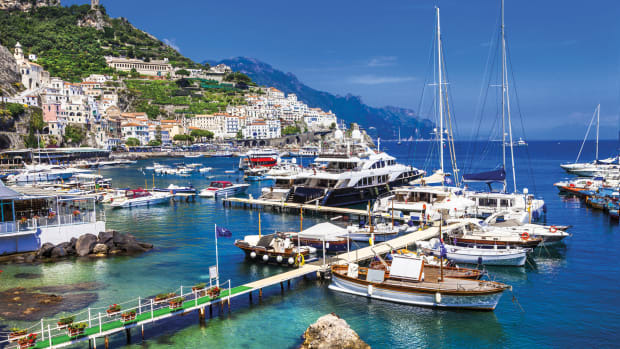 The combination of the boat’s big, efficient rudder, slippery hull, two-blade folding prop and 18hp auxiliary with saildrive provided plenty of power exiting and entering the marina. 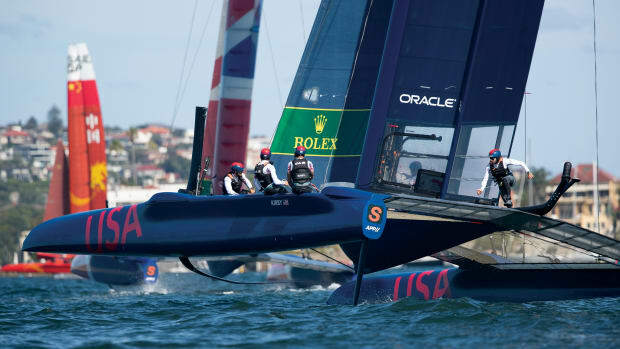 Not surprisingly, the boat spins in a very tight circle and maneuvers easily in reverse. The C&C 101 doesn’t just represent the latest step in racer-cruiser development: it takes the modern racer-cruiser concept to a whole new level, improving on its well-designed forebears in pretty much every way conceivable. This is a truly magnificent mid-sized boat.